Our new Literature editor provides an expanded and easier experience. 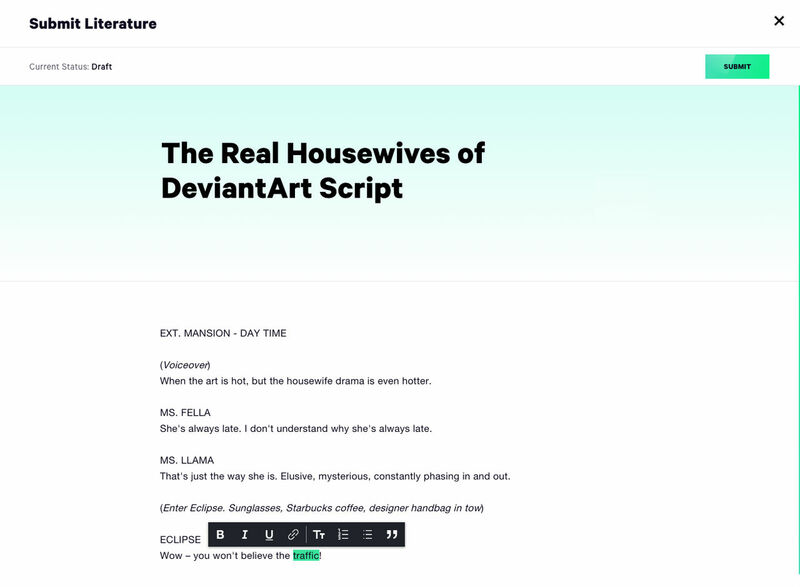 You can now bold, italicize, underline text without HTML knowledge, and you can even add corresponding visual imagery or link YouTube videos. Based on your feedback, Literature thumbnails now include a preview of text so that deviants can get a sneak peek at what words lie in store! We&apos;ll also be further adjusting the look of the thumbnails by dimming the opacity of the letter to make it less distracting. Read more about it in one of our past change logs here. It is vital for text to be visible above the fold so that your art gets the spotlight it deserves, just like visual deviations. Literature text is fully open to be appreciated as a whole, and we also made sure the actions are visible at both the top and bottom of each Literature deviation. This way some deviants can fave and save for later, while others can read through the deviation, and then fave, comment, share after they&apos;ve finished. The choice is yours! Thank you to the Literature community for being so open and vigilant with their feedback. 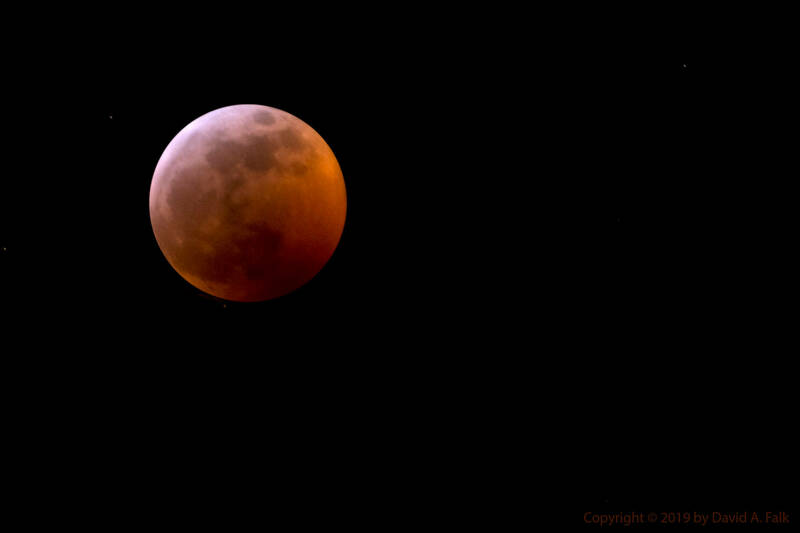 We want to keep building and strengthening your Eclipse experience. Upcoming updates will be announced in @danlev weekly change logs as soon as they are live. Share with us in the comments how you&apos;ll be writing and/or reading Literature in Eclipse! Feel free to mention us if you have Literature-related questions, comments, or want to know our favorite flavor of ice cream! This site helped us all learn HTML. Needing HTML in this site is not a problem, rather feature. Agreed. We are moving into an age where everyone knows at least a little HTML, and if they don't, they should. HTML is a fun tool to learn new things. Plus, you have a really beautiful raven feather profile pic. Just trying out Eclipse now, and got linked to this journal from your latest FB video. 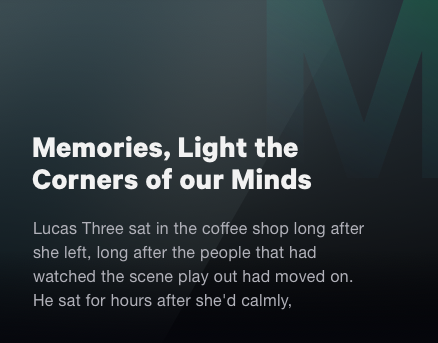 Will there be a feature to make it so that the text showing on the current literature thumbnail can be customized (for example, we can show a short summary/synopsis, kind of like what you can do on the inside cover of a book)? The nice thing about visual art is that it gives you an immediate feel for what you&apos;ll see once you click on it. This option could give a very similar power to lit submissions. I realise I'm late to the party on this journal- but regardless I wanted to drop my thoughts. I've been happy to have been involved in the brainstorming of these changes! It's really starting to look more comfortable now, and the action bar both top and bottom really is a great solution for everybody here. However, I still have a few thoughts and concerns that I would like to voice, and I thought this would be the best place to do so! Right now, we have the option through HTML to adapt a certain formatting and text size for our literature pieces, because as you may know, for some literature pieces, formatting is just as important as the words themselves. I've tried creating a literature deviation through Eclipse- and I found there is no such function anymore, unless I have missed it. Is this something that will be coming back? For many writers, this is an important feature to present their work well and to make sure that things are read in the correct way, in which case smaller portions of text would suggest a softer, more whispering tone for instance, where as bigger pieces of text are like yelling. Bolding, underlining and italics are great, but ultimately, it's not going to work for everyone. In Dino DA we have this little set of buttons at the top right of a literature deviation in which we can pick viewing sizes on text. We can make it a bit smaller or larger as desired, center the text or uncenter it to make it more comfortable to read for yourself. These are personal settings, and I use this quite a bit. Is there going to be something like this again? It can greatly increase reading comfort, and since people are already so easily discouraged to read something, I definitely think it is important that people have the options to make it comfortable to read for them without having to zoom in/out on their browser and so on. As I mentioned in my earlier section, smaller texts suggest a softer tone of voice, where larger texts suggest a louder tone of voice. In Eclipse, I feel like I'm constantly being screamed at when reading literature because the text is so big (and it also messes up formatting options put in place). Right now, literature tags are what binds our work to us. My tag is different from everyone elses's, and it works like an identifier. If there's an artist you enjoy, it's easy to look for their literature tag, and quickly find several pieces on the browse page by that one person, or in your watch page for that matter. And not just that, because despite the fact that it's such a teeny tiny image, it carries a lot of our identities in it. Will we get something like that in Eclipse again? Maybe some sort of background for the thumb that kind of shimmers through? Our own initials rather than the huge letter? (Because I am pretty sure that people will use that huge thumbnail letter to spell out God knows what kind of things nobody wants to read). Today I was browsing through my own literature gallery in Eclipse because I wanted to organise things a bit and try it from there when I noticed that the only distinction made anymore is Prose and Poetry. My non-fiction and fiction pieces are suddenly all prose. Personally, I think the distinction between non-fiction and fiction is an important one. It changes how you read things. It changes how you perceive things and how you go about writing a comment or a critique on a literature piece. If someone wrote a beautiful emotional piece that is non-fiction, you know to handle those emotions with care. When it's fiction, it changes the situation. Not having that distinction in the categories anymore is going to make it a lot harder to know how to perceive and read something, and whether or not to handle things with care as much, because I've never seen people mention in their deviation description whether a piece is fiction or non-fiction. Yuukon has put a lot of thought into this comment and I hope that it is not overlooked. I came to DA for writing, and when I saw that it didn't get much attention I branched out into other art mediums to get more attention. Though branching out has been good for me and I love all of the art forms I have explored, I do wish that the written word got more attention. I actually started a Wattpad account to share my literature, and it has been much better received in their format, but I would still love to be able to share my literature here. Never really last that long. Lasting all but a lifetime. Here you can see an example of how the size and formatting of a piece can drive home the emotions. The small words being whispered, the italic stressing the feelings. I totally agree, I love my tag! I understand if you may think they are tacky, and then not everyone personalizes theirs, but I love what it adds to my little thumbnail. You can quickly see the above thumb is mine (and I made it to match my profile), it also gives a more artistic flair to my work. Think about it, all books need a cover, well, all lit deviations need a little something too. I think giving the writer an option to give their literature a watermark on their thumbnail would make a big difference, that way it is not "tacky" however it is personalized to their taste. An example of what I am thinking of would be the way that the current watch feed thumbnails display, in dino da, if there is a picture in the post it is a watermark in the thumbnail. You could set it up like the lit tag so that a writer may select the watermark they wish to use from their settings. It would also mean that you could just use a photo of yourself, and would be simpler to adapt than a 25x100 little tag. I am so... so on this, however I would like more options other than just prose and poetry. I already hate how not enough is done for the lit community. I have been begging for a dual deviation since I got here, so that people who collaborate on something, be it literature and art, or just someone starting a project and another finishing it, so that both deviants can see the comments on the deviation without having to go to the others profile. Then you have some who comment on one persons and not the others, actually addressing a concern with the other persons portion of the collaboration. Here is the first collaboration that I did on DA and you can see the comments are addressing both of us, but if someone wants to say something to me, I would probably never see it. 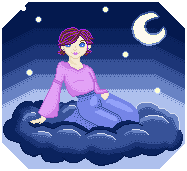 In the above deviation I worked with another artist, she came up with the original drawing and I pixeled it, then we worked with the color palette and lighting together, making it a true collaboration until the end, but she will never know what people say about her portion of the work unless she comes to my profile. I would also like to be able to search fixed format poetry verses free form as well. *Edit* Oh and chapters! I want my books to be able to have chapters rather than just being one giant document or tons of tiny broken up documents. MegapixelMasterpiece got a DD for our photo. Feels a bit weird because it's a bit like the lottery! That's also a more general issue in the photography world and nobody wants to listen to me when I say the model should get half the credit!!! There are so many photographs on here and you have no idea who the person posing is! Awww... you are only a little nuts, but not about credit, just in general. LualaDy Amarantheans I wholeheartedly agree! Deviantart is a great place for collaboration and both photography and literature are two areas that are ripe for collaboration, so why can't both members or multiple people get credited when for example they receive a DD? It would be an awesome thing for these partnerships to be able to share equally and both get the exact same recognition. I'm with Yuukon on this one, specifically in terms of truck formatting and the literature tags. My poetry is designed around how it flows, almost literally, and I am not the only one by a long shot. My work would lose a lot of its appeal and emotion if it's just shown in straight line and no text change. This goes for the sizing options for a reader in the submission itself - I always reformat it to dark themed and centered when I read someone's work - period. It's comfortable on my eyes and makes it that much more appealing to me than before. As for the literature tags, I choose the one I have currently because it ties into the theme of my WIP debut novel. I've had it for quite some time, and it's a part of my identity here. It perhaps doesn't seem like a very big feature to keep but I for one would miss having it. *text formatting, GG my mobile typing skills. Eventual scrolling literature preview texts. Customized literature tags to return. A smaller font for the deviation literature titles; and in general. Beautifying personalization tools for journals that mirror and/or improve upon the current CSS. Sta.sh Writer (or some other format) for storage; to provide pre-scheduling tools to save my projects and writing in advance. not hopeful, including your comments here. I'm just hoping they get it more Lit friendly before launch. I'm hearing you on the author tags. I would very much like to see them coming back, or some variation thereoff. Massive steps in the right direction, and it pleases me to no end to see one of my stories included in the examples! I like the new Literature editor - it's going to take some time to see whether there are any friction points, but as I write externally and copy/paste into the editor before posting, I expect it will do just fine. Happy to see Gallery Folders - I figured that was bound to show up, but I'm happy to see that it did. New previews are much more functional than previously - I miss the scrolling text, and would love to see that implemented again - I find myself reading the first paragraph or so in the preview before I commit to following a link down a rabbit hole, so that feature is going to be sorely missed, but this is much better. As a web coder, being able to get access to the raw markup is something I always want in a text editor, especially one that provides basic WYSIWYG html editing (bold/italic etc. ), and that would alleviate some of the issues people who want strikethrough text etc. are having at the moment. Actions bookending the deviation top and bottom is a simple addition that provides a great functional improvement! Thanks again to the entire team working on the Literature specific improvements, I'm sure there are a massive number of people clamoring for priority with the available development resources, so the attention to our vertical is very much appreciated. Footnote: I can't see these update journals in Eclipse, so I have to switch back to the old view to find them in my notifications and respond here, which seems odd. And yes, Hot Notices have not been implemented in Eclipse yet, so unless you watch me or @danlev you&apos;ll need to switch to the old site to see them. Not to worry – we&apos;re working on having Hot Notices be visible in Eclipse soon! What I'm more worried and freaking out about is the question..will all our journals we have written/saved in Sta.sh be deleted when the update roles out and with the new Literature editor? As well as any deviations/drawings we have saved in Sta.sh, but mainly the journals? I've been freaking about this for a long time and have started backing up all of my written stuff on journals I've in Sta.sh, unposted for later when the time comes to post them, into Google Docs so I don't risk loosing any info I have saved that I worked hard on or is important, only to loose it all. I use Sta.sh writer for everything to write down anything since it's easy, save and organize it into groups so I know what is what instead of them spread all over the place and scrolling through multiple things to find specifically what I'm looking for. I just don't want to risk loosing all my journals and important stuff I have written down. Sta.sh is not going away. It is still accessible in Eclipse (click on your avatar to access Sta.sh). Journal drafts can be saved and accessible either through Sta.sh or by going to your Profile > Posts > Drafts. I hope that clarifies! Ooooooo, so if I'm reading that right..
That means whenever the update roles out officially for Eclipse, and old DeviantART is gone, all our journals in Sta.sh that're not posted will be saved, not deleted with the official transition when replaced with Literature editor? Yep! Nothing is being wiped in Sta.sh. Your Sta.sh remains your Sta.sh! Oh thank god, I was panicking so much and for no reason, because people said our journals in our Sta.sh would be deleted since Sta.sh writer is being redone to something different for writing purposes. Thanks so much for this clarification/confirmation! This takes so much weight and stress off my shoulders. (maybe << and >> for "skip 5") would be nice too. I recommend submitting this as a feature request through our official feedback forms! I keep seeing updates for profiles / blogging features, but what exactly will happen to the groups? Can we expect an update with an in depth explanation of how groups are going to function with its features, group admins, literatures, submissions, management, coding, etc.? I know several people are concerned howits going to impact certain groups like the ever growing art / literature groups and all i have read (so far) is all based on what is happening with personal profiles with no mention of other area features of Deviantart. Playing the 'waiting game for its release' for this information can be stressful for many members who run/participate in groups. At the moment, Groups will retain the same functionality as it does in the old site. We do intend to revamp Groups, as well as redesign it to fall in line with the rest of Eclipse. We will communicate with deviants when we intend to start design and development on Groups. Thank you for using my photograph in your journal! Much appreciated. Thanks for a gorgeous deviation! "You can now bold, italicize, underline text without HTML knowledge"
What about the strike option ? Or the small one ? And as some other beta-testers said : the way the text is shown is inefficient, we have to scroll a loooooot to read a little, between two large empty spaces. It's a big problem for writers, because it's very difficult to keep readers active. If it's less easy to read, they'll loose their public. And probably migrate to another platform. The font is too large and the leading (spacing between lines of text) is too much. I'm really far more inclined to post previews of lit on DeviantArt and host the literature proper in a Google Doc because of this problem. Would be really cool to get night-mode in classic skin of DeviantArt, its easier to follow feedback there, in new eclipse mode is always confusing, that's why I've always revert to old skin to realize what been happening. Sorry to hear that! Are there any specific actions you find more confusing in Eclipse? Yeah, it groups everything in one spot and once you click it it removes it, so im not sure if i have comments, notes, or journals, i like more the way it separates each one in classic mode. Are you referring to the Watch page or Feedback page? I think its notifications on old layout. Thank you sooo much, for all the hard work. I agree BUT why change anything? Looks great, but even though you made it possible to do certain things without using HTML I think it should still be available to use if the author so-chooses..
Our goal is to make writing literature, journals, and comments as easy and accessible as possible. Since not everyone knows HTML, we want to make all features accessible to everyone by implementing them through the editor interface. If you need to use HTML for a certain feature, that means people who don&apos;t have those skills aren&apos;t able to use that feature. If there&apos;s something useful that HTML can do, we would much rather implement it as part of the editor so that all users have access to it (and would likely be even easier to use for those who are HTML pros). What specifically about HTML are you trying to do that you can&apos;t do with the current editor? Meow Monday 3/25Can&apos;t believe I missed last week&apos;s Meow Monday feature! I apologize, my feline furr-ends. These past few weeks have been cray cray busy, but I ain&apos;t complaining. I get to do so many things I love (like browsing cat artwork). Here&apos;s some cat faves of the week, in particular, ones that make me laugh:Here&apos;s an absolute ear jam for all of y&apos;all to enjoy as well. I cannot stop listening:Gimme cats. Gimme Lizzo. I&apos;m a happy gal.Have a good week, babes.